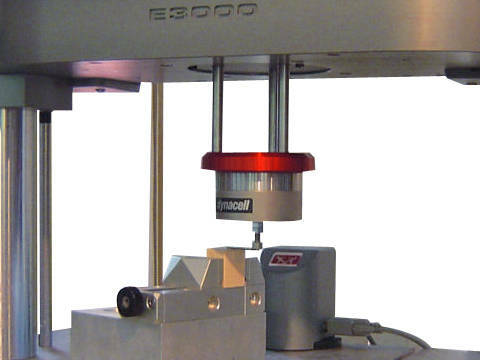 ASTM E8 / E8M is the most common test method for determining the tensile properties of metallic materials. First released in 1924, it was originally named ASTM E8-24T and is the oldest actively-used standard for the testing of metals. As with most standards, ASTM E8 has often undergone frequent, minor changes. Recently, however, one of these changes has been significant. Prior to 2011, ASTM E8 / E8M was divided into two separate standards: E8 for imperial unit users and E8M for metric users. The two standards have now been combined for the sake of simplicity into ASTM E8 / E8M. 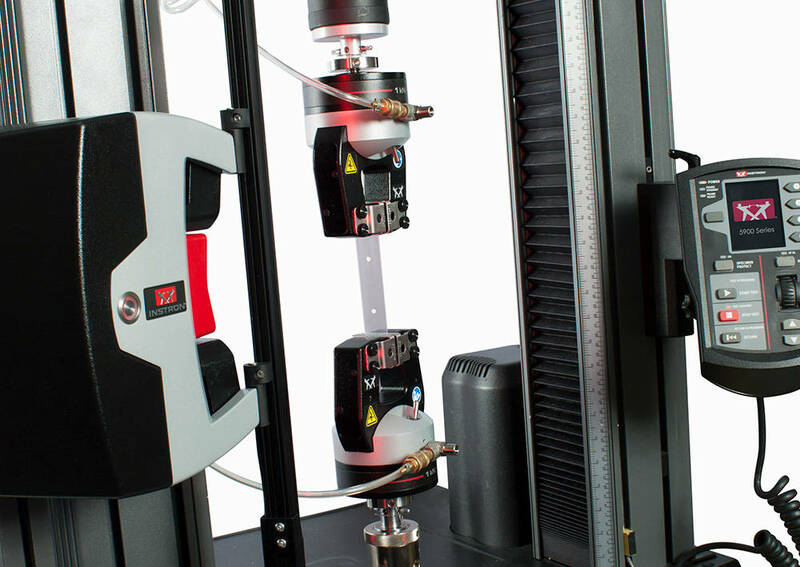 This guide is designed to introduce you to the basic elements of an ASTM E8 / E8M tensile test and will provide an overview of the materials testing equipment, software, and tensile specimens needed. However, anyone planning to conduct ASTM E8 / E8M testing should not consider this guide an adequate substitute for reading the full standard. Because ASTM E8 / E8M testing is conducted on such a wide variety of metals, system force requirements can differ greatly. The Instron® 5900 Series offers test frames suitable for testing sheet metal (10kN) all the way up to steel plate (600kN). The 5900 Series load frame includes pre-loaded bearings, precision ball screws, a thick crosshead and base beam, and low-stretch drive belts. These features contribute to better performance by producing more accurate results and minimizing the energy stored during a test, which is especially evident when testing high-strength materials such as aerospace composites, metal alloys, and crystalline polymers. ASTM E8 / E8M allows for many different specimen types and defines suitable geometries and dimensions for each one. Bars, tubes, sheets, pin-loaded specimens, round specimens, and powdered metallurgy products are some of the many options for testing to this standard. However, the most common specimen is a dogbone-shaped rectangle with a width of 12.5 mm (0.5 in) and gauge length of 50 mm (2 in). As with the most common metals testing standards, there are three types of test controls described: Stress Rate Control, Strain Rate Control, and Crosshead Displacement Control. For ASTM E8 / E8M, these types of controls are referred to as Methods A, B, and C.
While there are many different gripping technologies suitable for E8 / E8M testing (wedge, side-acting, hydraulic, pneumatic, etc.) they can all be classified as either proportional or non-proportional according to the way in which they exert clamping force on the specimen. With proportional grips, the force exerted on the specimen is proportional to the tensile load being applied. As tensile load increases during a test, so does the gripping force on the specimen. 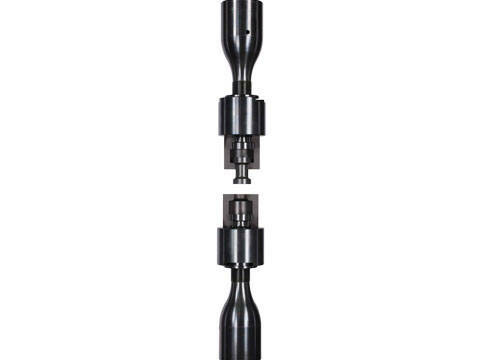 Wedge grips are a popular option for proportional gripping and come in manual, pneumatic, and hydraulic varieties to suit a wide range of testing applications. The shape of a wedge grip is what allows it to exert proportional pressure: as tensile force is applied to the specimen, the specimen is pulled more tightly into the narrowest area of the wedge, increasing the gripping pressure. With non-proportional grips, the clamping force on the specimen remains consistent and is independent of the tensile load being applied. 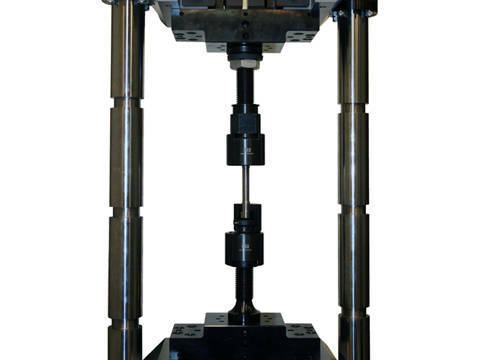 This is typical of side-acting grips and fatigue-rated hydraulic wedge grips where the clamping force is generated by a power source that is not directly associated with the tension loading of the specimen. This source is typically a high pressure (210 bar/3000 psi or higher) hydraulic supply. One benefit of non-proportional grips is that the clamping force is typically adjustable, which offers more potential application advantages. When a specimen is inserted into the grips during test setup, unwanted compressive forces are usually produced. 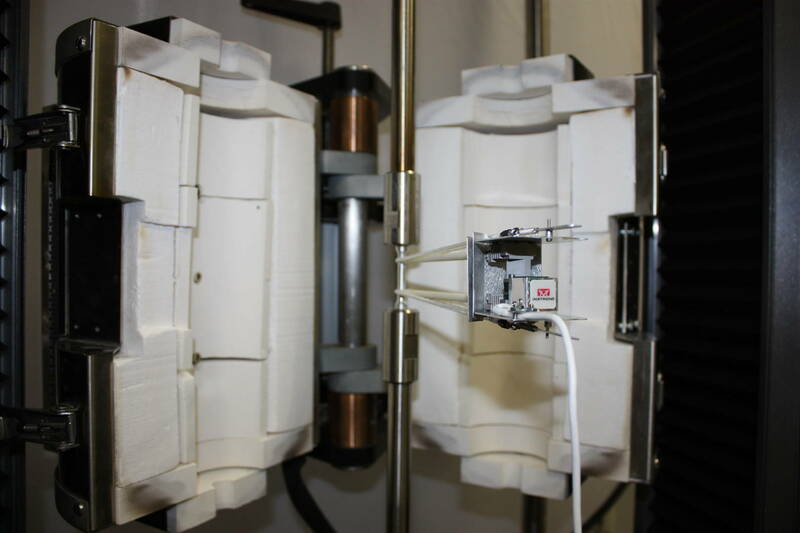 This is because a small amount of material is displaced by the pressure and extruded back into the body of the specimen, effectively pushing against the load cell. These unwanted forces can cause deformation in the sample and errors in the test data. Because they do not apply heavy forces during test set up, proportional grips can keep these unwanted forces to a lower level than non-proportional grips. 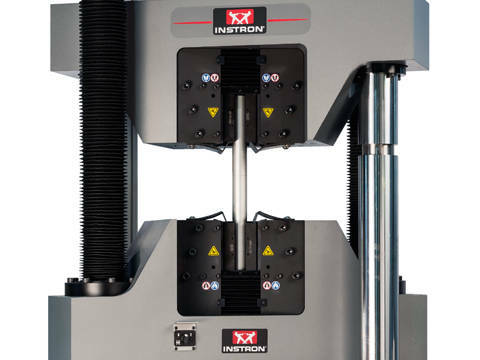 Instron 5900 Series features Specimen Protect, which automatically adjusts the position of the crosshead during test setup to automatically remove the compressive load, regardless of the gripping solution chosen for testing. Most metals testing standards require a high-accuracy device to determine properties at lower strain values, such as modulus or yield, and a slightly lower-accuracy device for high strain values, such as uniform elongation or total elongation. ASTM E8 / E8M requires a Class B2 or better device (per ASTM E83) to determine yield and elongation values that are less than 5% strain. For results greater than 5% strain, a class C or better device is required. There are three different types of extensometers that are typically used for ASTM E8 testing: clip-on devices, non-contacting devices, and automatic contacting extensometers. Clip-on extensometers such as the 2630 Series are the most common type used. These devices can provide incredibly accurate and stable strain data and are typically cheaper to purchase than other types. They need to be robust enough to survive high-throughput testing labs and absorb any shock from the breaking of high-capacity metallic specimens. 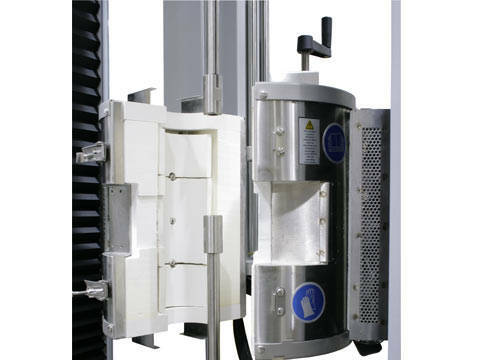 Automatic contacting devices such as the AutoX750 offer the benefit of repeatable clamping forces and placement, which can remove variances between different operators placing clip-on extensometers manually. Automatic contacting devices can also adapt to multiple gauge lengths, which can be cost effective for users who need to test a variety of specimen types. 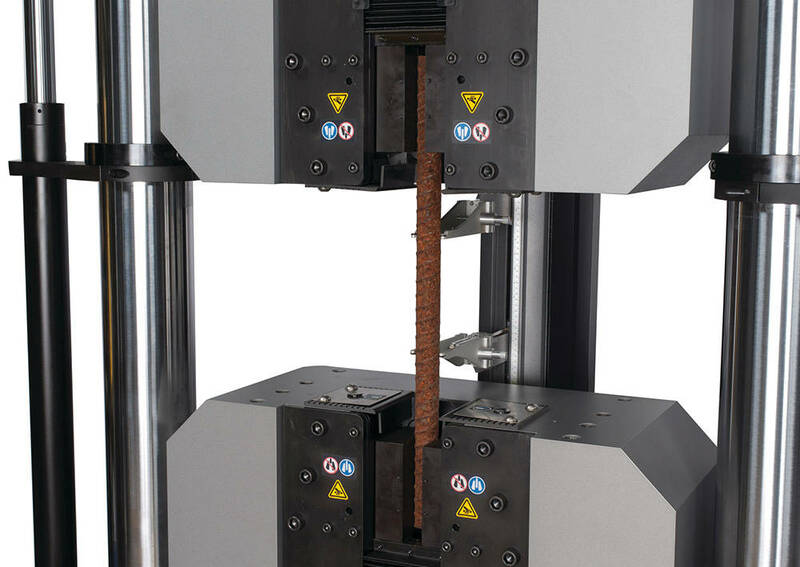 Combined with Bluehill® Universal software, the AutoX750 can be set up to remove itself automatically just before specimen failure, in order to prevent any excessive wear to the knife edges. Non-contacting devices such as the AVE 2 Automatic Video Extensometer offer the benefit of removing any influence from the extensometer touching the specimen. For instance, if a test specimen is very thin, the weight of a clip-on device can alter the results considerably. The knife edges used to affix the device to a fragile specimen can also damage it and cause premature failure. 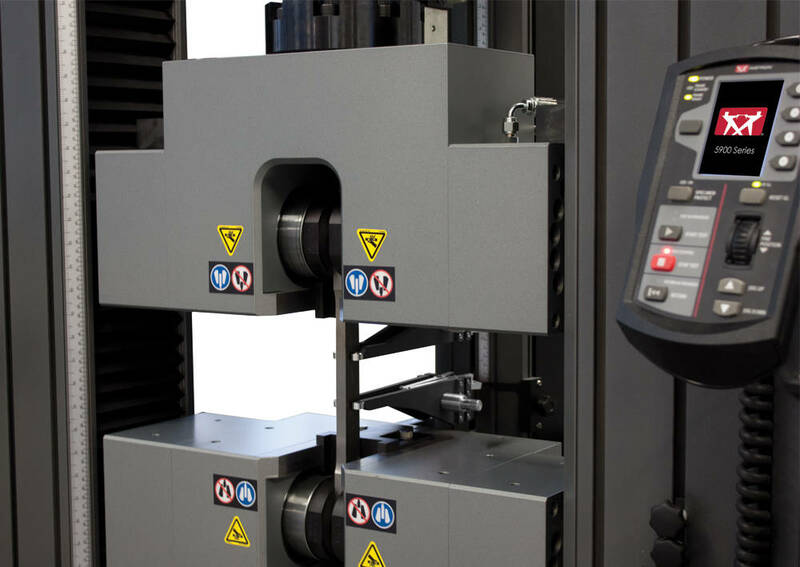 Furthermore, because the AVE does not contact the material, there is no potential for the extensometer to be damaged or worn when testing high-capacity materials. All calculations required in ASTM E8 / E8M testing are already preconfigured into Buehill Universal. For those who prefer to start from scratch and build their own method, manually input calculations can also easily be configured to test to ASTM E8. The metals methods package also provides pre-built methods to all of the following standards: ASTM E8 / E8M, ASTM A370, ASTM 615, ASTM E646, ASTM E517, ISO6892-1, EN10002, ISO10113 & ISO10275. Most labs testing to ASTM E8 / E8M need to test a high volume of specimens on a regular basis. For this reason, anything that can be done to increase throughput is advantageous. Fortunately, there are many options for increasing throughput for ASTM E8 / E8M testing. Small software modifications can reduce repetitive tasks, and some grips and extensometers can reduce setup time and increase repeatability, which will reduce the need to run retests. Finally, there is the option to fully automate the entire testing process, where testing can run for several hours without the need for any operator interaction.